Pest description and crop damage Adults are somewhat smaller than a house fly. They have brownish to black wings with dark bands. 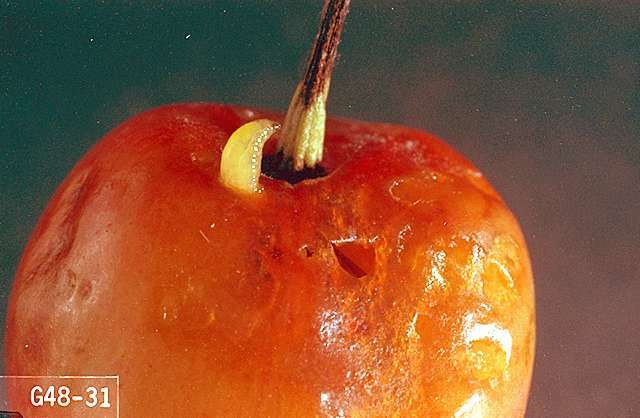 White maggots infest cherries. 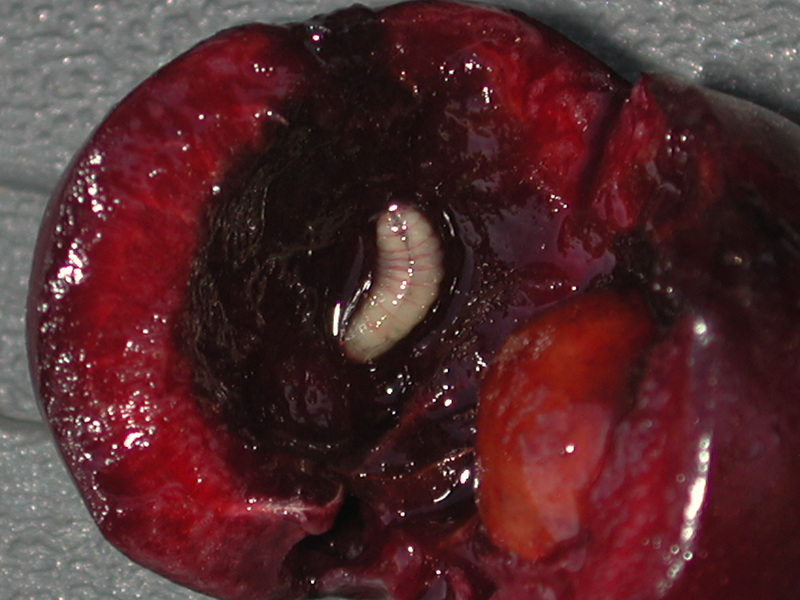 The mature maggot makes a hole in the cherry as it exits. 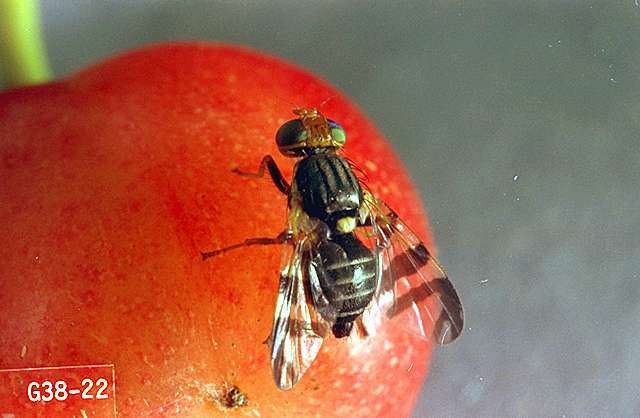 In the Northwest, the western cherry fruit fly is known to infest both home grown and commercial cherries. Western cherry fruit fly is also found in wild bitter cherry (Prunus emarginata). Biology and life history The flies overwinter as pupae in the soil. The adult flies emerge from the soil from mid May, about 5 weeks before harvest, until the end of July. Peak emergence often coincides with harvest. Adults feed on honeydew on leaves and pollen. 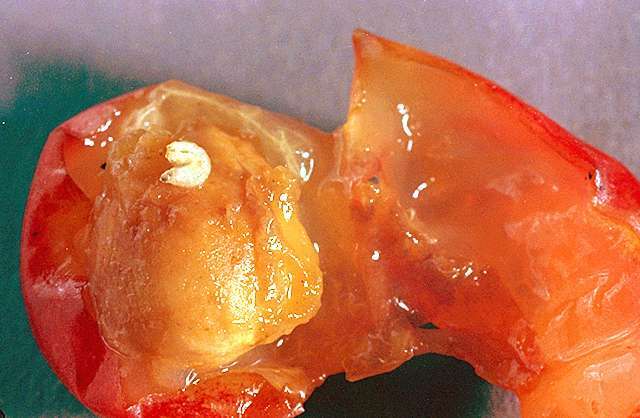 After 7 to 10 days, females lay eggs under the skin of the fruit. The eggs hatch, and the larvae burrow toward the pit of the fruit. There they feed for 10 to 21 days before boring out and dropping to the ground to pupate. There is one generation per year. Adults emerge early the following season. A few pupae of western cherry fruit fly may remain in soil as long as 3 years. Pest monitoring There is no tolerance for cherry fruit fly in cherry fruit, thus the threshold is zero. Degree day models are used to determine first emergence in the major cherry production regions of the Pacific Northwest. Consult with your county Extension agent to determine the development of cherry fruit fly populations in your area. Yellow sticky traps hung in sunny parts of the tree will attract adults. Monitor daily. Home orchardists: Grow early-maturing varieties such as 'Chelan.' Pick fruit within 8 to 9 days of catching the first flies, which will happen before egg hatch. Remove all fruit from the trees to eliminate sites for the fly to reproduce. Cultivation of the soil has not been effective, as the pupae are very hard-shelled. Begin spraying late May and continue through harvest. Spray at 10 to 21 day intervals. Degree-days can also be used to better determine fly emergence which is 950 degree-days after March 1.
kaolin clay (Surround at Home)-Applied as a spray to leaves, stems, and fruit, it acts as a repellant to some insect pests. OMRI-listed for organic use. acetamiprid (Assail 70WP) at 2.3 to 3.4 oz/a. REI 12 hr. PHI 7 days. carbaryl (Carbaryl 4L) at 2 to 3 quarts/a. REI 12 hr. PHI 3 days. Extremely toxic to aquatic invertebrates; avoid spray drift and runoff to surface waters. diazinon (Diazinon 50W) 4 lb/a. REI 4 days. PHI 21 days. Do not exceed one in-season application per year. esfenvalerate (Asana XL) at 4.8 to 14.5 fl oz/a. REI 12 hr. PHI 14 days. May aggravate spider mite problems. Extremely toxic to fish and aquatic invertebrates; avoid spray drift and runoff to surface waters. imidacloprid (Provado 1.6F) at 6 to 8 fl oz/a. REI 12 hr. PHI 0 days. Do not use until pollination is complete and bees are no longer present. malathion (Malathion 57EC) at 1 pint/a. REI 12 hr. PHI 3 days. May injure certain varieties of sweet cherries. Malathion sprays may be less hazardous to bees. malathion (Fyfanon ULV Ag) at 16 oz/a. REI 12 hr. PHI 1 day. Not a stand-alone product for SWD control. Do not use sequential sprays for SWD control. Maximum applications per season: sweet cherries- 4; tart cherries- 6. Repeat treatments after heavy rain if label allows. spinetoram (Delegate 25WG) at 6 to 7 oz/a. REI 4 hr. PHI 7 days. Maximum four applications per season. Spinosad bait (GF 120 NF) at 20 fl oz/a. REI 4 hr. No PHI listed. Apply every 7 days. Apply immediately upon first emergence. Can be applied by air or with an all-terrain vehicle. Apply 0.8 to 1 gal/a with a D2 nozzle (without a core) attached to an ATV traveling at 6 to 7 mph. OMRI-listed for organic use. Success 2F at 4 to 8 fl oz/a. REI 4 hr. PHI 7 days. Do not exceed 29 fl oz/a per year. thiamethoxam (Actara 25WDG) at 4.5 to 5.5 oz. REI 12 hr. PHI 14 days. Repeated applications may cause spider mite buildup. Do not exceed 11 oz /a per season. dimethoate (Dimethoate 4E) at 1 quart/a. REI 10 days (REI 14 days in areas with less than 25 inches/year). One post-harvest application permitted in Oregon, Idaho, and Washington. Do not feed or graze livestock on cover crops in treated orchards. Do not mix with Syllit.